Join the folks at the front lobby of Riverside Medical Center Wednesday (February 13, 2019) at 12:30 pm for their Cupcake War. 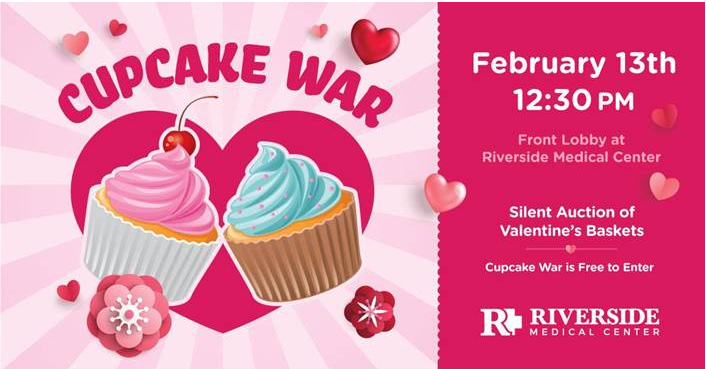 Cupcakes will be available for $1.00, and there will be “to go” bags to make the perfect Valentines Day treat. There will also be a Valentine’s Basket Silent Auction as well, with a lot of great baskets to choose from. The Silent Auction will end at 2 pm.